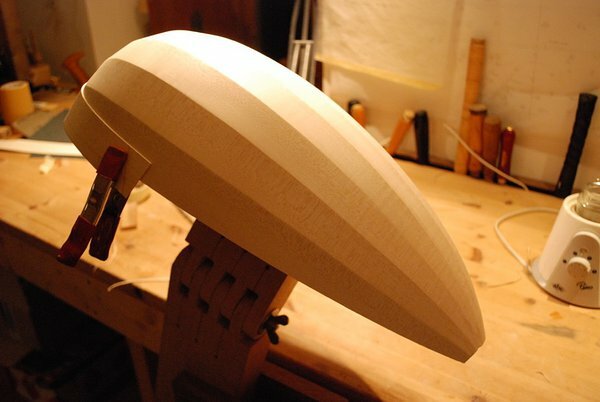 Here are some photos of the lute I am making at the moment for a customer. First of all; the wood I use is rather special, maple aged for 40 years and a spruce top bought in Mittenwald in 1996. This 7 course instrument is a close version of one of the two Hans Frei lutes in Kunsthistorisches Museum, Vienna. 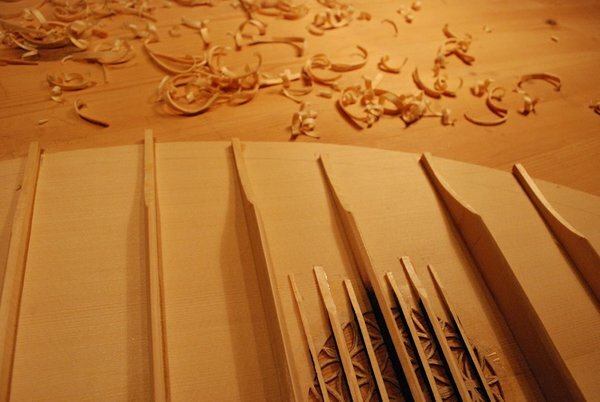 Frei was one of the famous Bologna luthiers. The other was Laux Mahler. 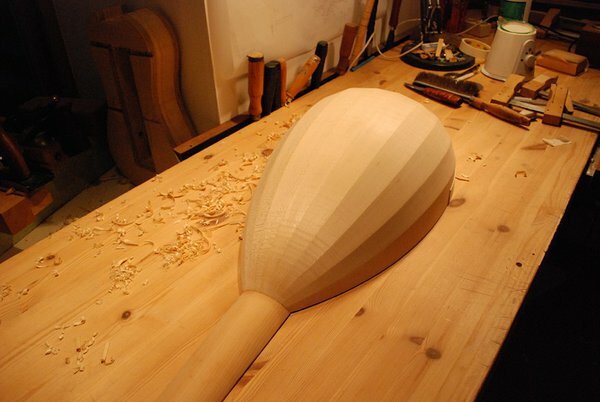 The shape of the bowl and air distribution inside a lute is largely responsible for the timbre and how it will ultimately sound in a room. 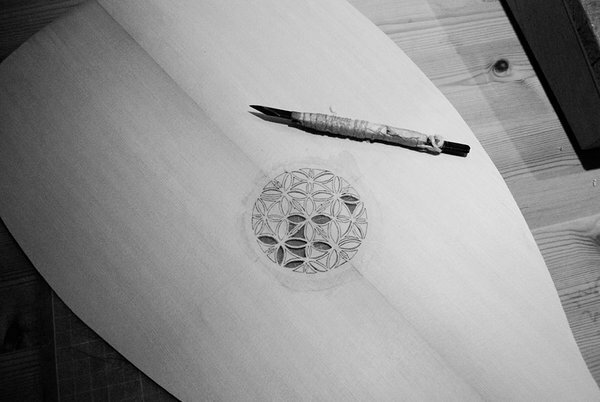 This model catalogued C34 on the drawing, has a very open rosette, which pattern allows for a large air opening that largely influence the fundamental air resonance, the volume and projecting of the sound. 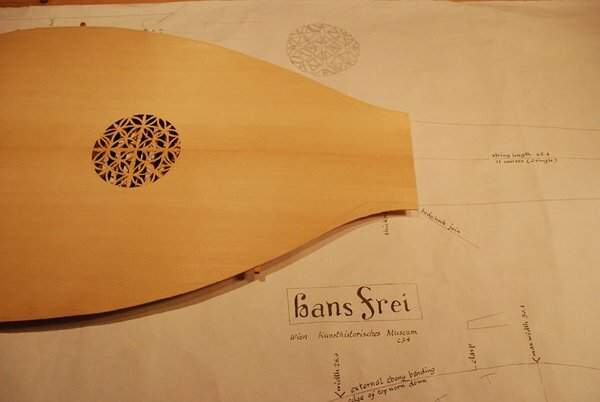 If the soundboard on this lute is as old as the bowl and made by Hans Frei, we may experience the result of his subtle concerns about the lute tone. A tone wich spelled musicians for centuries. The composer Ernst Gottlieb Baron wrote in his book "Study of the Lute" in 1727 (Translation by Douglas Alton Smith) : " - Thus the lutes that are too deep, in the lower part of the body, like a sack, as it were, and have small rosettes or resonance holes are worth little or nothing. But when the lutes are made shallow and have large rosettes, the tone is stout and strong and projects well into the distance". Think of the difference in tone of an oud and a lute! The oud is deep an round bodied, the Bologna lutes and later Tielke lutes are slender and shallow under the rose. The photos also show how the rose is cut from the back side and the small bars strengthening the fragile rosette. 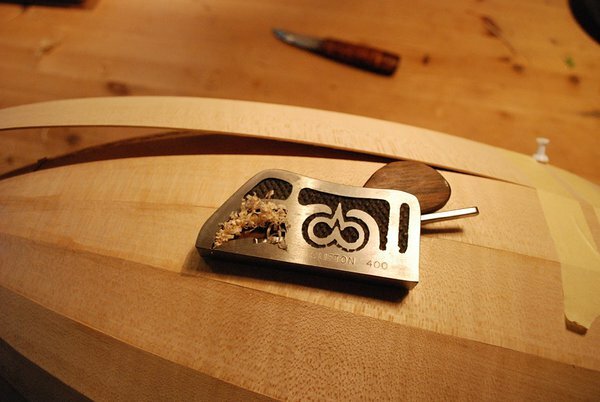 The main bars are positioned and shaped according to historical facts and my personal experience. Proper string height for the right hand.